Habit: Open. Stem: erect. Leaf: 1--5 cm, lance-linear. Inflorescence: terminal, with leaf-like bracts below; pedicel 3--20 mm, slender. Flower: calyx 7--10 mm, membrane not keeled; corolla bright pink to white, tube 10--15 mm, lobes obcordate to deeply 2-lobed; stamens short, anthers in corolla tube; style 0.4--2 mm, stigmas > style. Ecology: Rocky, wooded slopes, sagebrush scrub; Elevation: 500--2400 m. Bioregional Distribution: KR, NCoR, CaR, SN; Distribution Outside California: to British Columbia, Montana. Flowering Time: Apr--Jun Note: Several subspecies named; study needed. 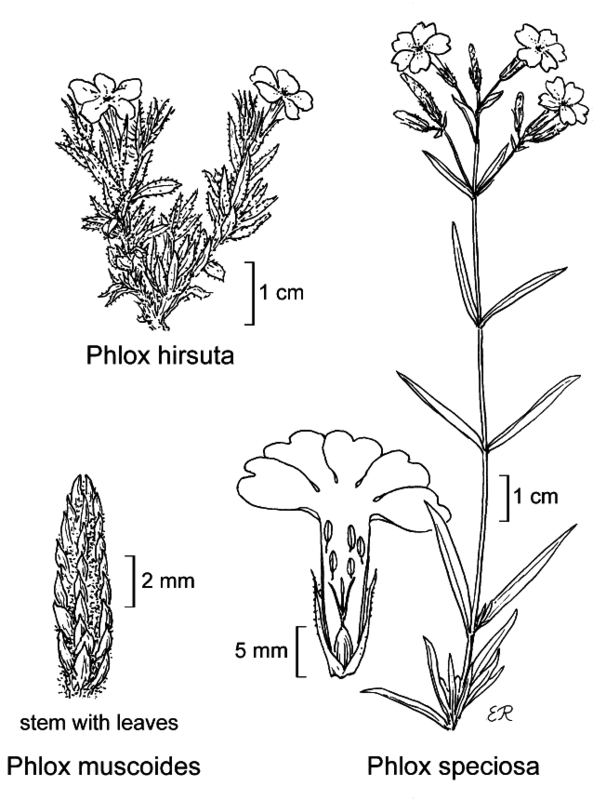 Citation for this treatment: Carolyn J. Ferguson, Suzanne C. Strakosh & Robert Patterson 2012, Phlox speciosa, in Jepson Flora Project (eds.) Jepson eFlora, http://ucjeps.berkeley.edu/eflora/eflora_display.php?tid=37861, accessed on April 21, 2019. KR, NCoR, CaR, SN; Markers link to CCH specimen records. Yellow markers indicate records that may provide evidence for eFlora range revision or may have georeferencing or identification issues. Purple markers indicate specimens collected from a garden, greenhouse, or other non-wild location.